With the New Year the entertainment from #ConManKen is simply priceless, Well, Marcus the Enabler is certainly skilled too and together they are simply gold. Gotta love it when Marcus expects the blowback right from the start. 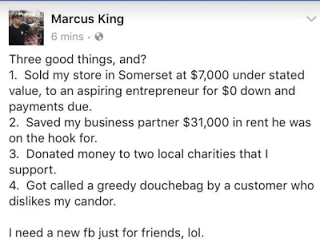 Remember when Marcus was going to sell close his second location at the end of last July? for no money down at that. Little Monster is the new name of the store under Ken's watch - I mean ownership - or is it simply management? See, look at the first screenshot. "He (Ken Whitman) is the manager of a store in Kentucky" - emphasis is mine. 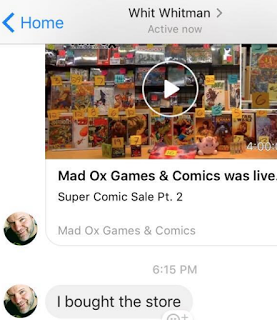 The follow up to that screenshot is priceless as Ken's rep is apparently well known and hasn't gotten better with age (i have more screenshots), but I'm more concerned that Marcus would attempt to add Ken to a Facebook Group for hobby store owners and yet introduce Ken as a manager. Who REALLY owns Little Monster? Who actually runs Little Monster? Did Marcus retain defacto control of the shop when he "sold" it to Ken for "no money down"? If Ken doesn't own the shop, why make it look like he does? I'm sure the IRS is going to be asking some questions, but honestly? If the store is only valued at 20k it's a popcorn farm. If Ken is living/ working/ managing/ owning it, I'd be shocked if he's still not living hand-to-mouth. Marcus must be doing pretty good to have written off the store and inventory. Although, if the store is only worth $20k it is exactly the sort of thing that the IRS still has budget to be auditing and looking into. Small pond. The Fed would be ZFG on two guys selling comics and Pops in KY as long as they are paying basic sales taxes, etc. False. Due to budgetary cuts at the IRS they generally cannot afford to go after many big fish anymore. Little fish cannot afford expensive representation to eat up the allotted time of the examination. Someone low on the financial chain is low-hanging fruit for the IRS. Do the number of complaints against one of the owners factor in at all when it comes to who is audited or not? Perhaps? The guidelines the IRS uses in such cases are not, to my knowledge, available to the public. Since the IRS offers a reward consisting of a percentage of tax collected from reported fraud, they do get quite a few reports a year. I'd think that number of reports would factor in, but certainly behind quality of information. It might be that the paperwork is clean, and the story we got was bunko. There's a lot of ways of doing these things legally, but sound like a scam. Marcus King apparently can't keep his story straight, which makes this a "birds of a feather" situation. I figured that out when they were selling comics "signed by the character". This stuff is going to be a movie one day, at the very least an A&M docudrama. maybe Ken can kickstart the movie... he has experience. I wouldn't make anything of "manager" vs. "owner." The only time you identify as owner is when you aren't also the manager, and you aren't soliciting for clients. That said....the entire email chain reminder up top is just more typical chiKennery.